Story: Locked in the forest. At times sin can be very attractive to us but the consequences lock us in places we don’t want to stay. There are two things that really make me frustrated. Getting lost and losing something valuable. Some people leave their things everywhere they go. I’ve lost my keys, wallet, parking pass, tools, my favorite pen! Now I buy 10 of the things I like so I will have more than I can possibly lose! Brian Regan puts a good perspective on balloons and wallets. And getting lost: I know where I am going! I know the road is just over there. Curby doesn’t run into Douglas and it makes a loop! This woman lost her coin, how did this woman lose her coin? Showing it to someone? Like a coin collection? Carelessness? Didn’t put them in a safe place? Accident? A hole in the bag? To be lost means separated from God, in the darkness and bound to the sinful nature. There is nothing to tie them to God. There is no reminder of God in their lives. They prostitute themselves to their lust. Generation after generation the parents teach their children more about the sinful nature than about God. Couches and Lazy Boys, refrigerators, washers/dryers, ovens etc. These are the same kind of places we find the lost. In the dark and dirty places. Dark: not having light. They have the lie instead of the truth. Dirty: not having self-control or self-respect. They live in dumpsters and don’t understand that they can be children of the King. 2Tim. 3:1 But mark this: There will be terrible times in the last days. 2 People will be lovers of themselves, lovers of money, boastful, proud, abusive, disobedient to their parents, ungrateful, unholy, 3 without love, unforgiving, slanderous, without self-control, brutal, not lovers of the good, 4 treacherous, rash, conceited, lovers of pleasure rather than lovers of God— 5 having a form of godliness but denying its power. Have nothing to do with them. Don’t partner with them in their sins… rather this is the people that need to be found! These are the patterns of the world, of our sinful nature thinking. We can see they are lost, now we got to get them to Christ. She swept the whole house looking for the coin. It takes some tools. What tool will we need? Isa. 9:2 The people walking in darkness have seen a great light; on those living in the land of the shadow of death a light has dawned. Jesus is the lamp of the world and they will see when He shines through us. We have to get our hands a little dirty some times. Its work to find something you’ve lost. I tear up my house and car looking for things! Cleaning a house or car can be a dirty job. We can get a little dirt and grime on us. Some can accuse us of catering to their sins. Jesus was accused of gluttony and drunkenness. He was accused of blasphemy and being possessed by a demon. People still accuse Him of lying and even having sexual relations with Mary Magdalene. 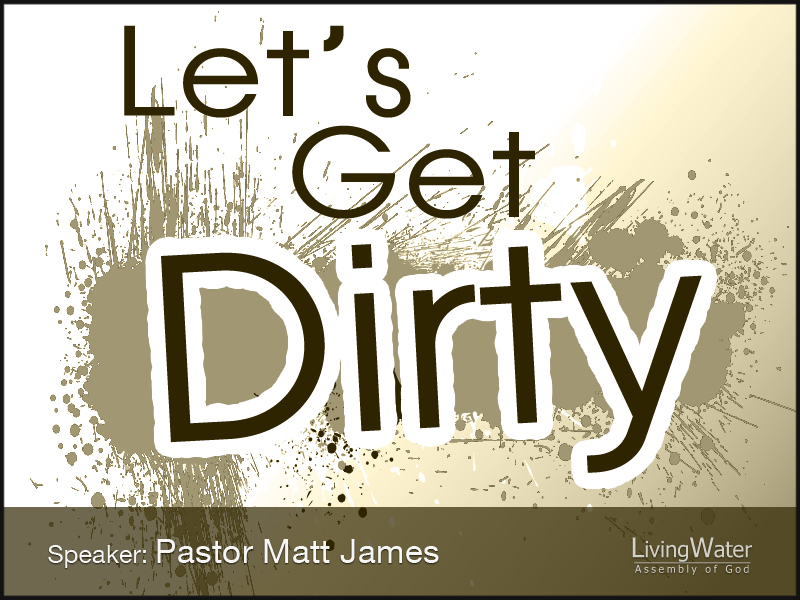 If we get accused of getting dirty, it’s okay, just don’t do the sins. If it’s not valuable to you then you wont look for it. Jesus was the tax collectors and sinners person of interest. Tax collectors had their own category of bad person. Do we have a value system on people? James 2: No favoritism! Jesus came to find all the coins. John 3:16 The world! What value to we put on the lost? What its made of. I had silver quarters worth $5 each. What it can buy. Gas, food, rent, etc. Our government sets value on our money for private and public use. Even if the material is not worth much the guarantee is. What value do we put on the lost? A soul is priceless and eternity is at stake. Our body is only good for spiritual sacrifice to God which leads to eternity. This is the exchange rate: our sinful mortal lives for His righteousness and eternity with Him. In a monetary manor look at Prov. 10:4 Lazy hands make a man poor, but diligent hands bring wealth. If we are diligent in finding the lost we will be wealthy! Wealthy with the saved! We are God’s reward for His hard work! He accomplished the salvation of the world. We can know the value God has set on our lives by what He is willing to pay for us. When we are hungry the personal value of our money rises. I want to find that last coin when I don’t have enough for the meal. When I don’t have much my things become more valuable to me. When we have a higher value on the lost the temporal things are put in right perspective. I am firmly convinced that the key to finding the lost is rejoicing with Christ. Heaven rejoiced over one sinner that repented! The joy is that we have eternal life; this is good news. The winning attitude of salvation is joy! Jesus was glad that the sinners wanted to hear the Word of God! We need to be inelegant with our ministry to the world. We need to be diligent and purposeful. We need to make a meticulous search of the community we live in. Getting a little dirty just means we are in the right place. It doesn’t feel good to be lost. There are people who want to be found!